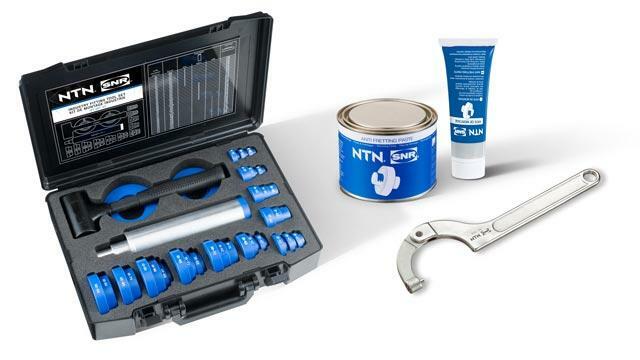 Maintenance tools for NTN-SNR bearings allows you to maximize the service life of your bearings and the productivity of your facilities. 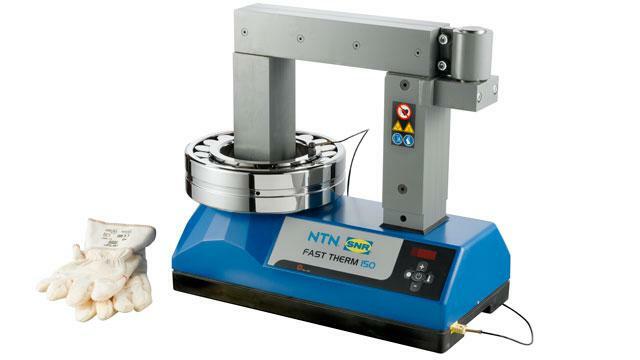 NTN-SNR has developed a range of tools dedicated to the hot and cold mounting of bearings. 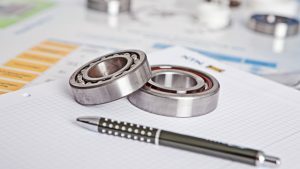 It reduces the risk of damage to bearings and increases their service life. Mounting kit: this mounting kit contains all the quality sleeves necessary for mounting the bearing in the normal way and completely safely. Assembly paste: this assembly paste is essential for mounting the bearings. It prevents rusting where contact is made between two metal surfaces. Adjustable spanners: hook spanners or pin spanners allow the mounting of nuts of type KM, KML, KMK and precision locknuts of type B, TB, BR, and TBR. With hot mounting, induction heating appliances ensure simple, quick and safe use. The choice of induction heating appliance depends on the minimum and maximum weight of the parts to be heated; the geometric dimensions of the parts to be heated; the temperature to be reached; the power and voltage available in the workshop. Our pullers and pulling plates safely facilitate the disassembly of bearings. These allow the disassembly of bearings ranging from 5 to 100mm, mounted tightly in housing. We offer you an ideal range of strong pullers with rods suitable for extraction via the bore. BP Set 5 44 for bores of 5 to 44mm. BP Set 45 100 for bores of 45 to 100mm. The BBPS 10-100 is suitable for disassembling bearings ranging from a bore of 10 to 100mm, fitted in blind housings. This group of pullers enables the disassembly of small and medium-sized bearings ranging from external maximum diameters of 120 to 270mm. These pullers are suitable for the disassembly of large bearings and force-fitted parts (pulleys and gearwheels) with a maximum external diameter of 325 to 680mm. The Push-Puller 8/12 Tons is suitable for both the mounting and disassembly of bearings and sleeves, through internal or external pulling This allows various maintenance jobs to be carried out without the need for additional equipment. Used in conjunction with a mechanical or hydraulic puller, universal pulling plates enable the disassembly of bearings when there is insufficient grip. The BPES 10-105 enables the separation and removal of bearings through internal or external pulling. 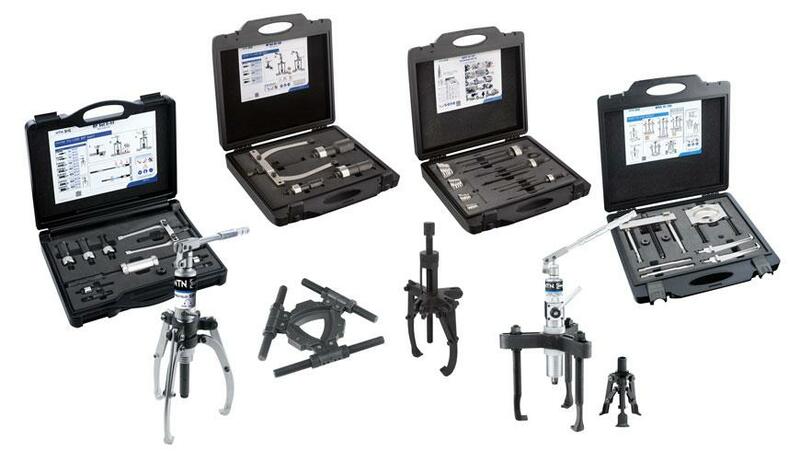 The accessories kit is a complementary tool to the hydraulic claw puller (where there is insufficient grip). The bevelled blades enable disassembly and prevent damage to the shaft length. This type of tool is essential for the mounting and disassembly of spherical roller bearings with a tapered bore. Our range of hydraulic nuts are suitable for shafts of 50 to 1000mm in diameter. Necessary for shaft diameters beyond a particular size, they provide perfect control of the adjustment when mounting; they limit manual effort; they reduce time spent on the operation. The "Back and Forth" technology used in our range offers great convenience as the piston is automatically recalled into its original position. 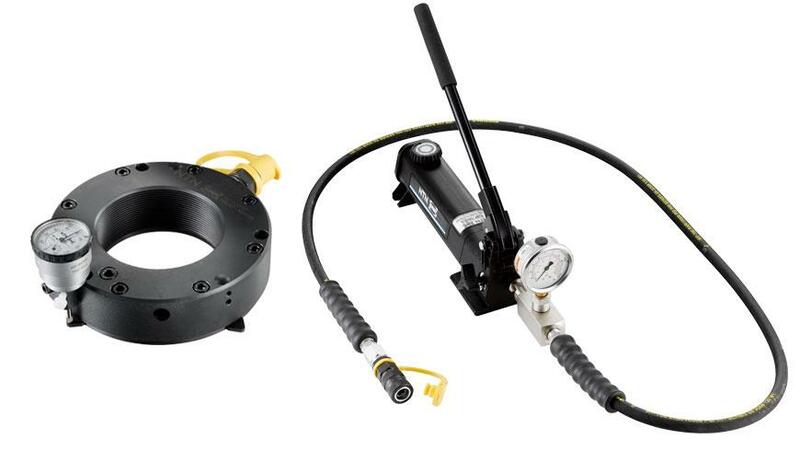 Ultra-lightweight and compact, the hydraulic pumps are designed to be used with hydraulic nuts. Less effort and increased safety. We recommend that you use NTN-SNR hydraulic oil. It contains corrosion inhibitors that do not attack sealing materials such as Nitrile. 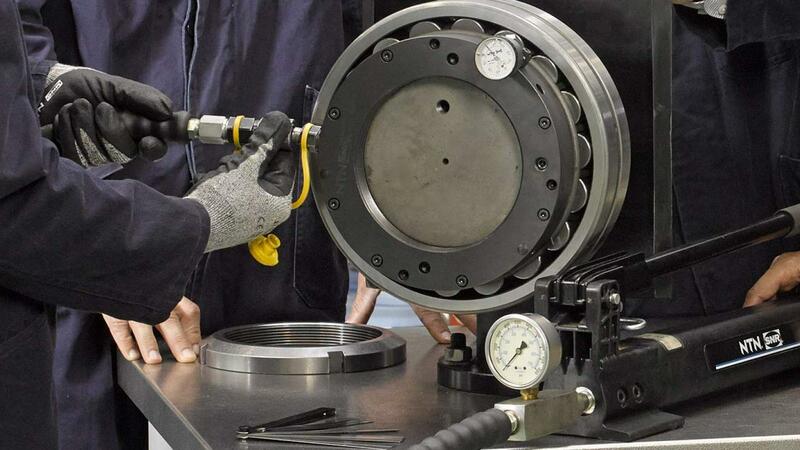 Connected directly to the sleeve, extension tubes enable the high-pressure injection of oil into sleeves or shafts with slightly thicker walls. The adapter allows you to connect the tube to the hydraulic fitting (not supplied with the adapter). 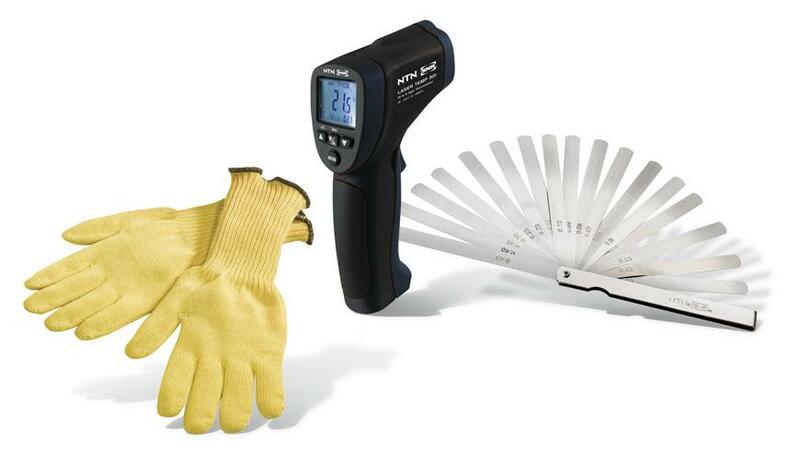 NTN-SNR safety and measuring instruments facilitate handling and monitoring. This infrared thermometer with laser sight enables an initial diagnosis of the functioning of the machine to be carried out, thanks to an accurate and completely safe measurement of the temperature, whether remotely or directly. A set of calibrated feeler gauges, enables a quick and accurate measurement of the radial clearance, particularly suitable for spherical and cylindrical roller bearings. It consists of 17 gauges and available in 3 blade lengths: 100mm, 150mm and 300mm. Heat-resistant gloves allow completely safe handling of hot and oily parts up to a temperature of +350°C.